Infinix Hot Note 2 X600 Review, Specs and Price in Nigeria: The Infinix Hot Note 2 lauched by Infinix Mobility is a smartphone built with high end specs to meet the ever changing trends in technology. The design and release of devices like the Infinix Hot Note 2 is one of the reasons why Infinix is becoming a popular brand in Nigeria. With the "Big 6" as this device is popularly known, the Hong Kong based smartphone company has combined affordability and functionality to give users a device to reckon upon. Customers response toward Infinix Hot Note had been so positive, with Infinix Note 2 we want to raise the bar and offer a better product. Infinix Mobility is offering new dimensions and new features that will simplify your daily use. The Infinix Note 2 is the 3rd variant in the Note series which included the Hot note and Hot note pro. It is a successor to the much admired Infinix Hot Note and has features that are similar to the other two variants in this series. Some of these similar features include their reputable large memory capacity, ultra-power saving mode and support for fast charge, hand gestures and dual micro SIMs. If you thought the Infinix Hot Note and Hot Note Pro were awesome, then this improved version might likely sweep you off your feet. The Hot Note 2 also features a different build/design and generally, better specs when compared to its predecessor. Some of these specs which have been improved upon include a larger display screen, more powerful cameras, newer software, a longer lasting battery and its most outstanding feature, a flash charge. 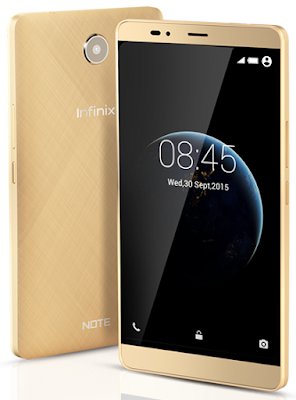 Given below is the specifications and price of the Infinix Note 2. The Infinix Hot Note 2 features a 6 inch IPS capacitive touchscreen, making up for its tagged name, the 'Big 6' and placing it in the category of a phablet. Compared to its predecessor, this device looks more appealing and larger. For some people who have found the Hot Note to be too big to be handled easily, i wonder what they'll think about its older version because the phone na Plasma tv..😛. The Infinix Note 2 has the highest screen to body ratio among devices released by Infinix Mobility. And for some people who found the display screen of the Hot Note not sufficient enough to meet their needs, they'll likely find the Hot Note 2 to be a captivating device with its massive screen, capable of providing a satisfactory viewing expertise. For those with butter fingers, the screen is made of a corning gorilla glass 3 for maximum protection from cracks and scratches. It also has a resolution of 720 x 1280 pixels and a pixel density of 245 PPI. Not minding the size of this device, the resolution and pixel density gives it the capability to produce images that are clear and vivid. The Hot Note 2 is made from plastic, has a dimension of 159.5 X 82.5 X 9.3 mm and weight of 194g. This device unlike the Infinix Zero has a removable back cover and its back cover features brushed textures to give it a sleek design and an incredible feel. The Note 2 comes in multiple colors options which include white, black, gold, champagne and copper, allowing users to personalize this device to their taste. The Infinix Note 2 runs on Android 5.1 Lollipop and is fully customised by the company's own user interface known as XUI. This XUI performs android-specific optimization to increase overall performance by 21% and standby time by 20%, thereby bringing about faster responsiveness and customizable interface. The Note 2 is powered by a 64bit MediaTek Octa-core processor with a processing speed of 1.3GHz and uses the Mali-T720 GPU. It comes in two models which are the Infinix X600 Note 2 LTE with 2GB of RAM and the Infinix X600 Note 2 with 1GB of RAM. Both models have an internal memory storage of 16GB which can be expanded via microSD card, allowing users of this device to save more apps, games, pictures, videos and other documents. The processor which is quite fast enables it run apps with great speed and the RAM's capacity can ensure smooth and efficient operation while multitasking. The Note 2 has a 13MP back camera with LED flash and a 2MP Front Camera. At first, users might think twice before buying a smartphone with only 2MP camera resolution, but the quality of images and video captured by a device does not entirely depend on the number of resolution of its camera, but also on the size of camera's sensor. It will be quite possible for the 2MP front camera to produce pictures with clear quality because its sensor size is big. Be rest assured that you'll be able to take pictures with decent quality especially during the day with this front camera because it has been well optimized. Some downsides still lie in this front camera since its low megapixel means that pictures that are cropped and zoomed might lose much quality. Also, the front camera does not have an optical Image stabilization feature that allows users to still take clear pics when in motion or when the phone is shaken. But some features present on these cameras include geo tagging, auto focus, touch focus and led flash. The battery capacity of the Infinix Hot Note 2 is 4040 mAh. This battery is based on Lithium-polymer technology and as with the Hot Note's battery, is non-removable. This device features an OTG data line which enables the Note 2 to be used in charging other phones and vice versa. Using its flash charge feature, the Note 2 has a quick charging capability where it that takes 1 hour to fully charge the device. Infinix claims that just 15 minutes charge equates 8 hours of phone calls. Also, this device comes with an advance ultra power saving function which automatically reduces the phone’s brightness and kills all apps running in background leaving only 6 basic apps. With this, the phone can stay powered on for 3 hours with 10% battery. For connectivity, the Note 2 has 4G capability to ensure speedy internet connection and also provides support for Bluetooth, GPS, WI-FI Hotspot and USB. In Nigeria, the Infinix Hot Note 2 is available and can be purchased from reputable online stores in the country. Depending on the model of the Note 2 you want to purchase, Infinix Note 2 Price in Nigeria for the 1GB version ranges from ₦35,000 to ₦41,000 while the 2GB version ranges from ₦41,000 to ₦50,000 . The RAM size, camera resolution and battery capacity are usually the basic features I look out for in a potential smartphone, and from the features and specifications of the Infinix Note 2 X600, this device which has been elegantly designed meets my criteria. When one looks at the design of the Note 2 closely, they'll note that it is unique from others in the Note series. Other than its design, Its display, good battery life and a beautiful user Interface makes the Infinix note 2 an amazing device for both business and leisure. Featuring those specs for a mid-range device, the Infinix note 2 is definitely worth more than the price it is being offered.